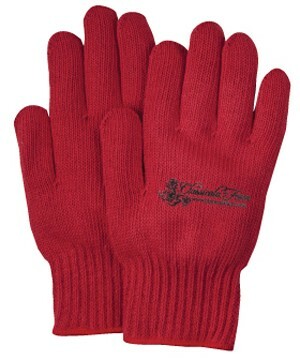 Red knit work gloves, medium weight, made in USA. 80% recycled, certified by OEKO-TEX standard 100. Great for runs & marathons. Available in black, green, red, royal blue, orange. For custom colors please inquire. PRICE INCLUDES: One color silkscreen transfer on both gloves. Optional 4 Color Process or Embroidered Patch are additional charges.